Exiland Backup Free is a free and flexible automatic file backup software that allows you to backup and restore your files. This program lets you backup data to various locations: local or network drives, FTP, SSH servers, removable devices, etc. The program can as well duplicate your backups to different locations. Exiland Backup saves your disk space by compressing your data as ZIP files. Problems with long paths and unicode are solved. An easily mastered tool maintains backups of files in the .zip format on hard and removable disks, in a LAN or WAN. Use import and export features to synchronize folders on two PCs. Other features include support for Command-line, SFX-backups. Lost your iPhone 4S contacts, photos, etc.? Hodo iPhone Data Recovery (iPhone 4S) can help you recover photos, music, contacts, messages and more from iPhone 4S easily and quickly: recover from iPhone 4S directly or restore from iTunes backup. Acronis Backup & Recovery 10 Workstation is designed to protect intellectual property stored on your business desktops or laptops. Acronis Backup & Recovery 10 Workstation combines simplicity of use and advanced options of data protection. 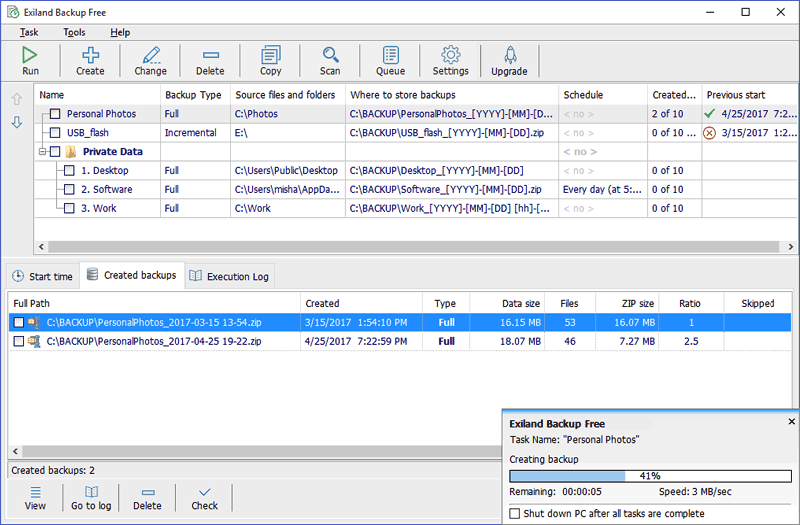 EZ Backup Quicken Pro makes it easy to backup your Quicken data files to a local drive, network folder, CD/DVD and even to a remote FTP server! EZ Backup Windows Live Messenger Basic makes it easy to backup your emoticons, backgrounds, winks, user tiles, moods and message history to any local, network or removable drive.